Ever since I started this project, I get asked all the time, even by people who are themselves experts on Homestead (! ), whether the Jewish community had any involvement in the famous 1892 strike that put Homestead in the history books. The short answer is probably no, but the longer answer, which will take up the balance of this post, gets at the nuances behind what it means to live through history at varying distances from the center of the action. While the Jewish community likely did not play an active role in the history unfolding around them, to call them bystanders isn’t quite right, because as you’ll see, much of the action occurred literally outside their windows. At the time of the strike, there had been Jews living in Homestead for more than a decade, though the community was small and unorganized. On the eastern side of the town, closest to the steel mill, were the Eastern Europeans, mostly Hungarian men in their twenties and their young families. This neighborhood was home to Homestead’s rapidly growing number of Eastern European immigrants (I’ve seen estimates ranging from 600-2,000 people), mostly non-Jewish Hungarians and Slavs who left their agricultural or laboring positions in Europe to work in the steel mill. The Jewish immigrants, on the other hand, came to the U.S. to continue as merchants or artisans selling to the same kinds of people they had been selling to in the Old Country. There was I.S. Grossman, a twenty-six year-old purveyor of men’s clothing, who immigrated as a teenager and moved from probably NYC to Homestead in 1886, where he met his wife, who came from Braddock. His brother, Jacob, who clerked for him, likely was living with them. 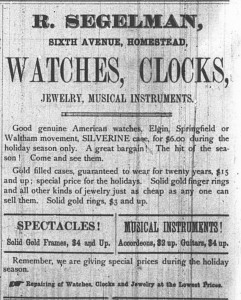 His wife’s brother, Louis Amshell, possibly lived in Homestead, too (or more likely lived in Braddock, but had his store in Homestead). There were at least three or four Markowitzes, whom it is impossible to keep straight, since there were two Sams, two Maxes, and some number of brothers who left an even lighter trace on the record. One of the Sams, who immigrated as a teenager, ran a grocery in a building he owned and lived with his wife of seven years and two sons (and maybe his brothers). The two Maxes were a clothier and a butcher. The one I can trace was married with a child. Morris Frankel, who was in his late 20s, lived at the rear of a boarding house on Fourth avenue with his wife, Flora, and at least one child. He had immigrated to NYC as a child and came to Homestead with his young family around 1890. As a cutter (the person in a tailor shop who cuts out the pieces of of a garment from the cloth), it is possible he worked for one of the Jewish clothiers. There were one or two Lithuanians in this part of town as well. 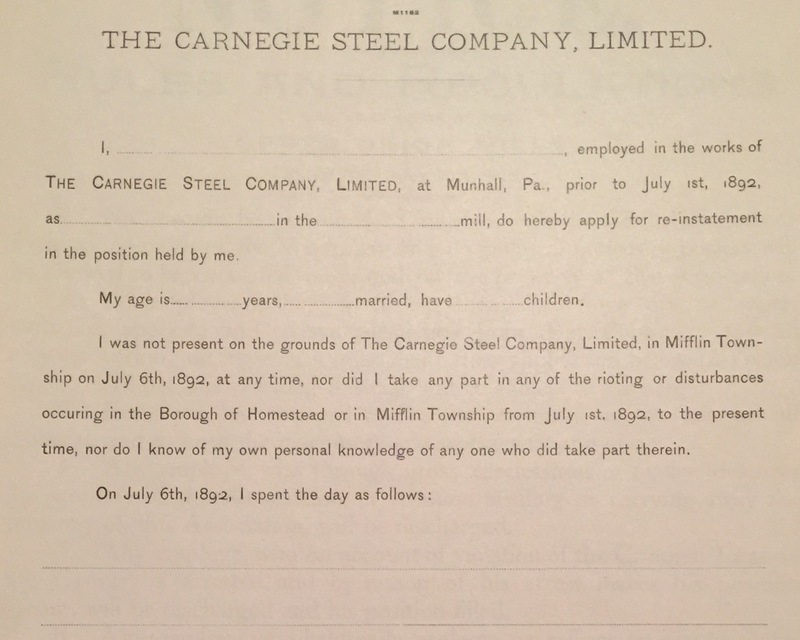 One was Abraham Skirboll, the only other property owner in the community, who came with his family from Allegheny City (now the North Side of Pittsburgh) just before the steel mill opened. Another may have been Joseph Lasdusky, then a twenty year-old bachelor who had previously been living with his family in Pittsburgh. 2 They were from the same town in Lithuania! Both were merchants whose stores would become amongst the town’s best well before the end of the decade. 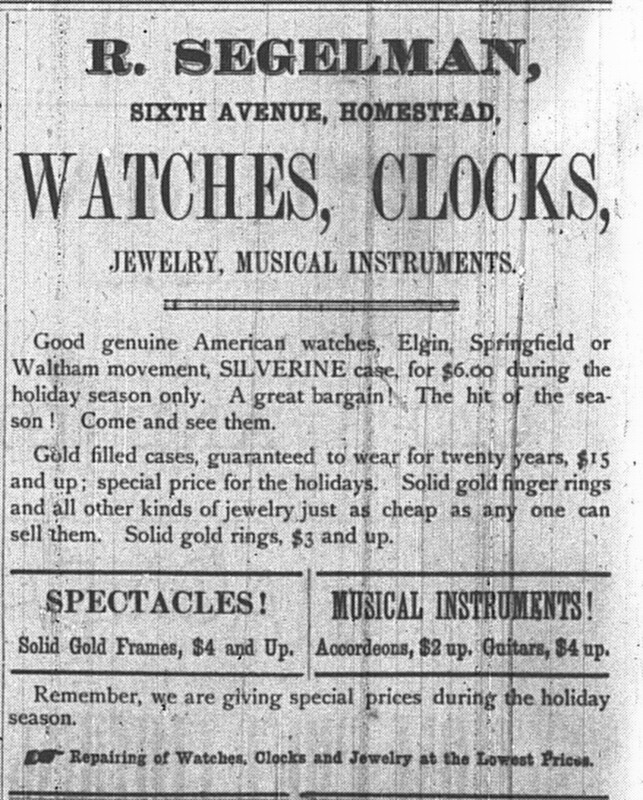 This ad ran on the front page of Homestead’s paper during the holiday season of 1889-1890. The couple families who lived in the nicer part of town and had shops on Sixth avenue, the main business district, were Germans who were a bit older than the Hungarian group. Ralph Segelman, a jeweler, was in his early 30s with a wife and six children. He, his wife, and oldest children immigrated to the U.S. in the mid-1880s. Marcus Heilbron, who was probably in his late 30s and likely immigrated in the mid-1870s, ran a dry goods store. He lived with his brother, who clerked in the store, his wife, and their young daughter. At the time of the strike this couple was less than a year away from a scandalous divorce. For all these people, Homestead was not their first stop in the U.S., so they were not isolated greenhorns with limited English and cultural awareness. And yes, they almost all were merchants — or working for merchants ’til they set up for themselves. The only exception was my great-grandfather, the one laborer. While it’s possible his labor could have been in the steel mill, it’s unlikely — not only because Jews in small towns largely sought to escape the factory work of the cities, but also because very few steel mills hired Jews in those days. So, for answers to questions about the Jews and the strike, we must make culturally-informed interferences based on geographical proximity. 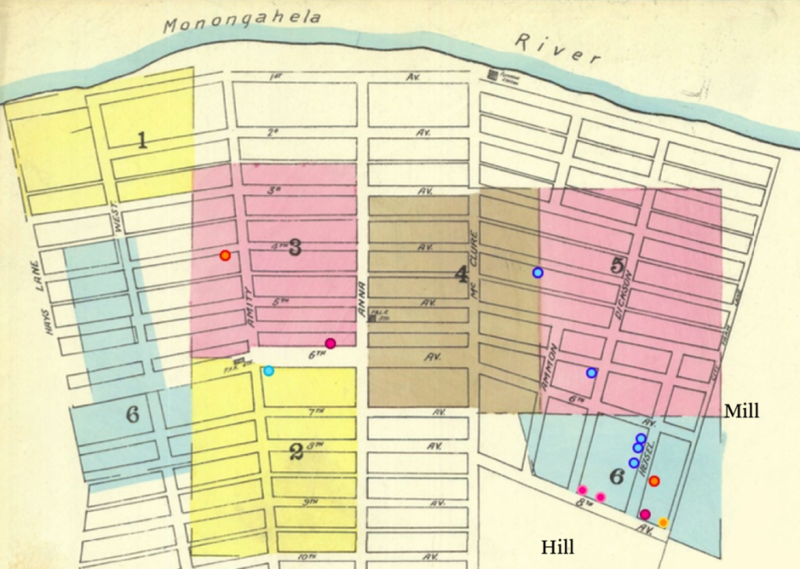 For once the strike got underway, as the maps above and below show, the ensuing action might have had nothing to do with them, but the community of Jews around 8th and Heisel found themselves at the center. 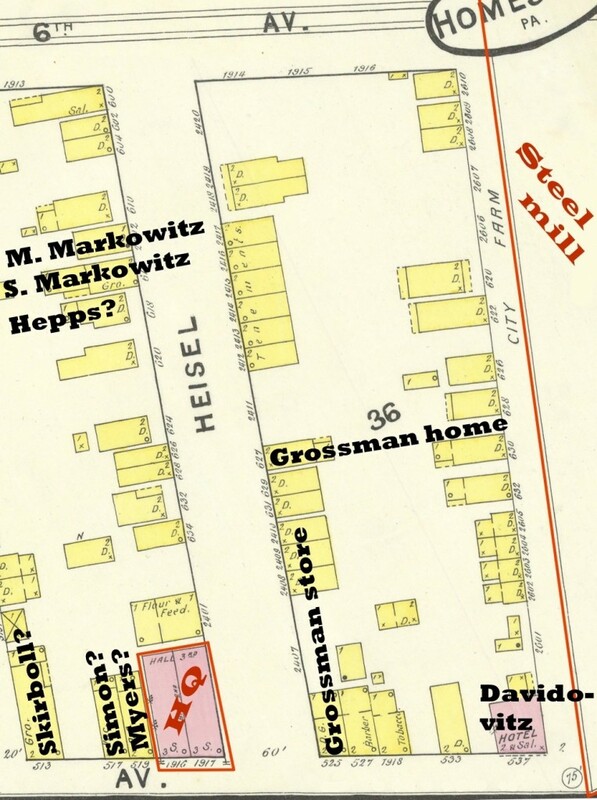 Close-up of 8th and Heisel, where most of the Jewish community lived. Adapted from the 1891 Sanborn map of Homestead. The first area of proximity to consider is the location of the steel mill itself. As both maps show, one block over from Heisel Street were the grounds of the Homestead Works. At the time of the strike, the mill buildings were clustered along the river, so this upper area was an open field. 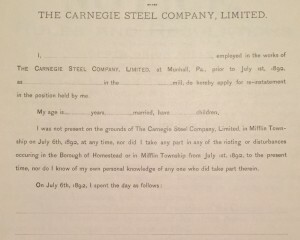 When contract negotiations between the union and the Carnegie Steel Company broke down in late June of 1892, H.C. Frick, who managed the mill for a vacationing Andrew Carnegie, refused to deal with the union anymore and locked out the men — literally — by building a 12′ fence around the property, complete with search lights, rifle peepholes, and barbed wire. The town dubbed the area “Fort Frick” and worried what Frick was planning to do with his military-like defenses. 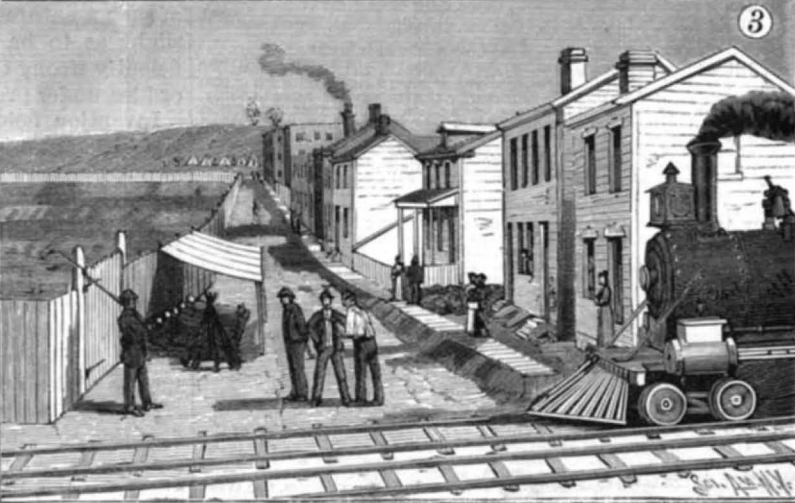 3 What he had in mind was a repeat of what he did under similar circumstances during Homestead’s last contract negotiation: bringing in Pinkertons, strike-breaking paramilitaries, to guard the mill and permit him to re-open it with non-union workers. Only this time the workers got the jump on him. Catching sight of the barges approaching the banks below the mill, one of them rode through the town at 3 AM on July 6, 1892 to rouse the townspeople, who gathered along the river. A long gunfight ensued, with the Pinkertons finally surrendering late afternoon after twelve men on both sides had been killed. (And to specifically answer a question I also get asked: No, none of them were Jewish.) As they came ashore and were escorted through the streets of Homestead, the townspeople attacked them. Contemporary accounts singled out the local Hungarians, especially the women, for their viciousness. 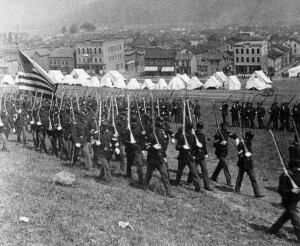 In response to fears of more violence in the town, as well as political pressure to protect Carnegie’s interests, the governor of Pennsylvania called in the state militia on July 12th to bring the town under martial law. Initially four thousand troops surrounded the mill and two thousand camped on the hill overlooking the town from which they could survey the area. This hill opposite Eighth Avenue (so labeled on the first map) is the second area of proximity. With the town brought to heel, the mill was soon re-opened with non-union workers. For the next three months the residents of the town were surrounded by soldiers who sided against their interests, but kept the peace throughout additional conflicts, including race riots amongst the non-union workers living on the mill grounds opposite the immigrant neighborhood. But even after the militia left mid-October, the strike dragged on. The union, which had found its own vantage point on the top floor of one of Homestead’s tallest buildings, realized their cause was lost. 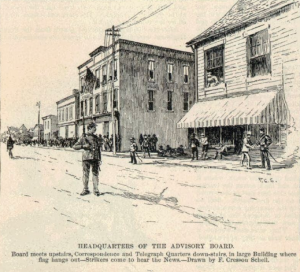 At the very corner of Eighth and Heisel, this building, the three-story Bost Building (labeled “HQ” on to the second map), is the third area of proximity. Journalists from all over the world made the building their headquarters, too, wiring out their reports from its telegraph office. The strike ended just before Thanksgiving when the union voted to return to work. In the end Frick got what he wanted. He broke the union, and the Homestead Works remained union-free until 1937. As is clear from the maps, the small Jewish community wasn’t just living in Homestead throughout all this violence and unrest. Most of them lived adjacent to the locations that became central during the long months of the strike. This proximity certainly stirs our historical imagination: what did our ancestors see and experience? And how did they feel about it? In the world they had known in Europe, local unrest often took an ugly, anti-Semitic turn as frustrated parties let off stream. While this labor dispute had nothing to do with them and at no time was their safety actually at risk, how did they perceive these events as they were unfolding? When a man on horseback rode down their street at 3 AM and their neighbors rushed to arms? When the whole day was filled with gun and even canon fire? When thousands of their neighbors wrought mob violence on the streets of their town? And what about the long months afterwards, when every time they looked out their windows they saw soldiers parading down their streets and encamped opposite their neighborhood? Given the long history in their former homes of soldiers being sent to trouble, not protect Jewish residents, such a sight must have been frightening at first. They came to America believing it to be a very different place, but what was taking place around them must have tested their courage. Admittedly, this is all speculation. It is impossible to know what they saw, felt, or even did. I describe them as observers, but perhaps they did were amongst the thousands of townspeople who kept watch on the banks on the Mon, fought the Pinkertons all day, or formed the gauntlet on the streets through which they were forced to run? Without even a shred of evidence from which to infer, all I can conclude is that the generalization that small-town Jews tried to keep their heads down and avoid trouble is born out by so many examples, both in other towns as well as later instances in Homestead, that my gut feeling is that they would not have actively participated. Their circumstances were markedly different from those of the large urban Jewish communities that agitated for social justice. I suspect that when Russian Jewish anarchists Emma Goldman and Alexander Berkman made headlines for their attempted assassination of Frick on July 23, they would have gone out of their way to make sure their non-Jewish neighbors understood they were of a very different sort (just as the strikers had to distance themselves from the anarchists, too). The only evidence from which we can guess at how the Jewish community was faring are newspaper articles about the economic situation in Homestead during the strike. 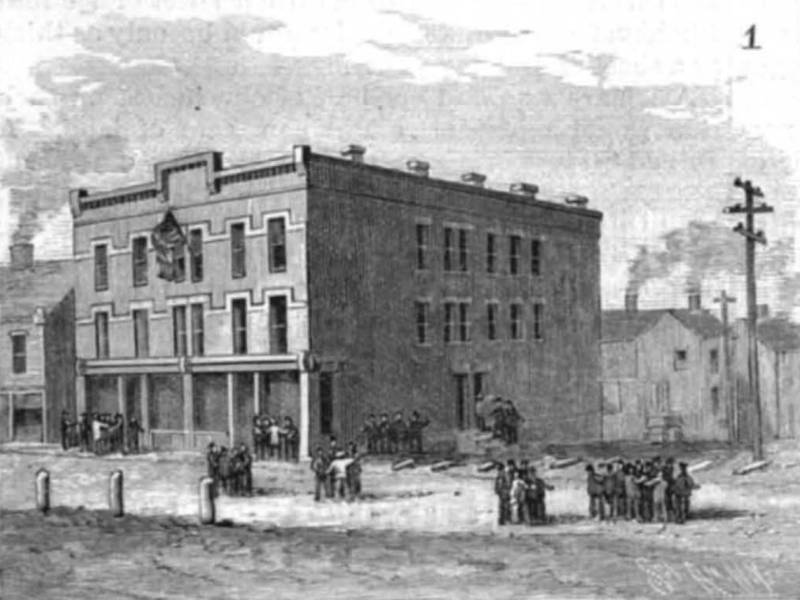 “It is not the four thousand workmen alone who are affected by the lock-out, but the ten thousand inhabitants of Homestead,” pronounced Homestead’s weekly newspaper just before events turned violent. 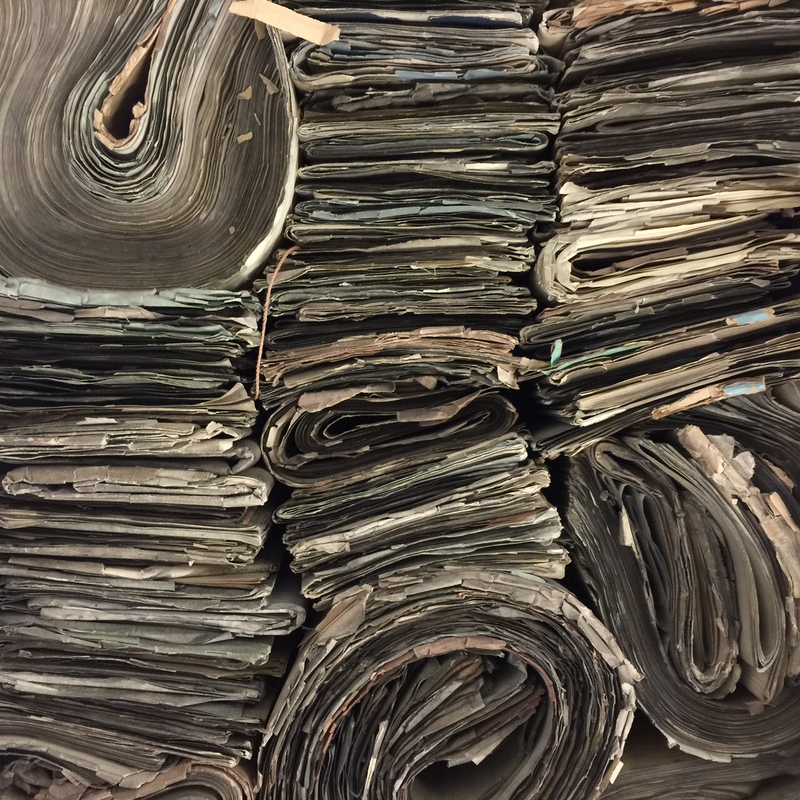 Typically the town’s businesses (primarily run by men of a very different background and social standing) suffered whenever there was any work reduction at the mill, but the paper offered some surprising evidence to the contrary. 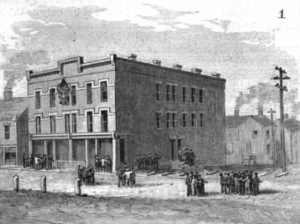 After the militia arrived, the larger number of troops meant that local stores were doing exceptionally good business, and even after they left the paper claimed the non-union workers were making up the difference. I suspect these examples belong on the long list of times where the newspaper’s insistent optimism muddled their reporting, as there is much more evidence to the contrary. Itinerant peddlers avoided the town, local advertisements proclaimed, “our prices have been cut down to suit the times,” few residents were paying taxes “due to the depression caused by the strike,” and some merchants asked to be exempt from providing charity for the unemployed workers since they were already selling to them on credit. 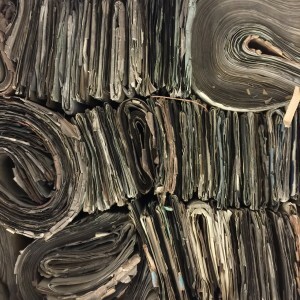 4 The paper had to admit the ongoing strike produced “months of serious stagnation,” and conditions only worsened after the strike ended, because the union ceased its benefits to the strikers, and most were not re-employed at the mill. A canvas of the workers just after the strike ended found so many in need that the entire town became the object of worldwide charity, despite the newspaper’s protests that the situation was exaggerated. So, it seems pretty clear that the merchants, Jewish and mostly non-Jewish, suffered the secondary effects of the strike. But interpreting this evidence primarily to understand the situation of the Jewish community means missing its real thrust. To be clear: the victims of the strike were the workers and their families. 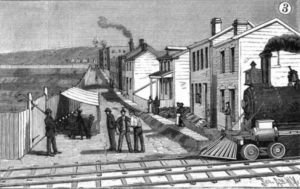 There are aspects of Homestead’s history where the omission of the Jewish community’s role produces narrow, biased results, but the Homestead Strike is not one. There isn’t a forgotten story here that would change our understanding of what happened. The conclusions drawn by historians regarding the battle between labor and industry are not in question. And yet, if re-examining the strike from a novel angle demonstrates anything, it is that the ripple effects of the battle for workers’ rights went far beyond the parties involved. 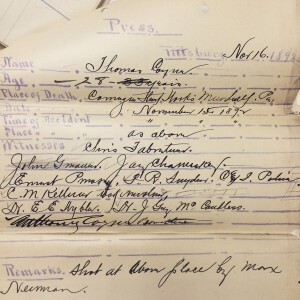 As an early example of a news story covered in real time, the Homestead Strike resonated across the whole town, region, country, and even world, upending everyone’s previously held notions about what labor and especially business were capable of. Even those who may have previously considered themselves apart from this unfolding battle were shocked into awareness that in a world rapidly being remade by industry, there was no longer an “apart.” Though most who lived during the months of the strike played no central role, the ways it affected them point to the blurred lines dividing participants and observers when local events take on a global import. 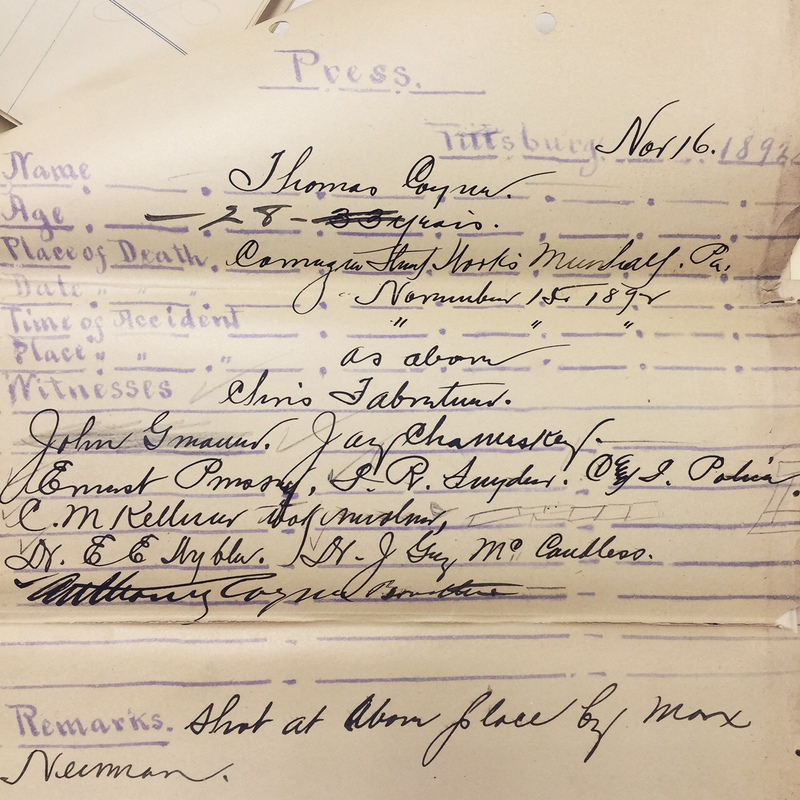 According to [Max] Newman’s [sic, should be Neuman’s] story he was lying asleep in one of the apartments of the mills when [Thomas] Coyne entered and struck him in the face. The blow dazed him and he thought at first it was one of the strikers who had assaulted him. He drew his revolver and fired toward the ceiling, at the same telling Coyne to get out or he would kill him. Coyne than made a rush at Newman and he fired again. The ball entered Coyne’s head back of the ear. He fell to the floor and died almost instantly. about 6 o’clock last night [Coyne] left his boarding house in an intoxicated condition. He took several bottles of whisky with him and went to work. He continued to drink throughout the evening and became very drunk. He started about 10:30 o’clock into the mill, but became bewildered and instead of entering his own room entered that of Newman. A tragic mistake born out of fear, this murder is a minor story omitted from most histories of the strike. It may be of interest to us, though, since while this particular article refers to Max Neuman as a Norwegian, another paper reported he was a Hungarian Jew (and the name does sound like it could be). 7 The newspapers report he and his brother came from New York City in response to the call for non-union laborers to re-open the mill. If indeed they are Jewish, they’d be the earliest known Jewish workers in the mill and the only ones known to have been involved directly in the strike. While the court case has never turned up, I found the newspaper articles about his trial! The grand jury returned a true bill for murder in mid-December. He was tried on December 28, 1892 and acquitted within ten minutes. Nothing from the articles clarifies Newman’s background. denounced the acts of the union men on the outside who had made threats against the men in the mill, and he said it was by reason of these threats that the defendant thought his life was in danger. For a more detailed look at the strike and its aftermath, including the evolving opportunities and obstacles for the Jewish community, see my April 2017 lecture, From Milltown to Hometown: How the Homestead Strike Shaped a Community.